DKC Knives is thrilled to release its newest addition to their handcrafted line of Damascus Steel Knives. The "BANCHEE" is a handmade fixed blade Bowie hunting knife made by artisans designed for premium quality. This knife was a Valentine's gift for my husband. He was very pleased and impressed with it. The craftsmanship of this knife is stellar. It really is a pretty knife. The leather case and honing rod are also very nice and make this a complete gift. DKC Knives, known for their beautiful handcrafted Damascus steel knives, has just released it's newest addition to their custom made hunting line. The "BANCHEE" is a beautifully handmade fixed blade Bowie hunting knife made for performance and functionality. Each knife is handcrafted to precision, with a steel wood grain finish handle and blade that makes for a unique look with the distinct design of Damascus steel. The blade is 5 inches and 10 inches in total length. The “BANCHEE” has a custom made grip that fits securely in your hand and provides a quality weight for all hunting needs. One review from an Amazon customer raved, "This knife was a Valentine's gift for my husband. He was very pleased and impressed with it. The craftsmanship of this knife is stellar. It really is a pretty knife. The leather case and honing rod are also very nice and make this a complete gift." Each "BANCHEE" knife is equipped with a leather seethe and sharpening stone. DKC Knives is proud to announce the new "BANCHEE" as one of the best selling fixed blade Bowie Hunting knife. DKC Knives has a variety of unique engraved Damascus steel knives that are sleek, elegant, and durable. DKC Knives is a USA based custom handmade knife manufacturer that has a variety of knives that make perfect gifts for men as well as women. Damascus steel knives are coveted by knife collectors around the world for its distinct patterns. Even if you’re not a knife collector, most people appreciate the beautiful craft of a handmade knife. It’s truly a piece to admire. So if you’re looking for a gift for a special occasion, DKC Knives provides a unique service of helping you find the right knives for your group or loved one. Owner of DKC Knives, Paul Gordon, explains, “One of the great things about finding a company like DKC Knives is that we have over 350 models. Once you see how much he likes the first knife, you will now know what to buy for him for birthdays, anniversaries, Christmas, and other occasions for the rest of his life. Many customers own over 50 pieces of our collection...it’s that nice”. 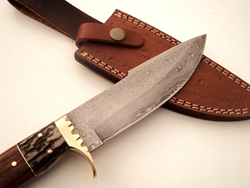 Today Damascus steel knives are coveted by knife collectors around the globe. DKC Knives are affordable and of high quality. Gordon reiterates that, "DKC Knives was founded with a mandate to bring reasonably priced handmade Damascus folding pocket knives, and fixed blade hunting knives to the public at very reasonable costs. Today DKC Knives can be purchased for a relatively modest cost of $60 to $300". DKC Knives has a growing list of collectors that own many of the company's models. DKC Knives makes it full knife collection available direct to the public through it's on line web site http://www.dkcknives.com. While both men and women buy and collect knives, the DKC line up has been a tremendous hit with women wanting an incredible gift for their husband, boyfriend, or a special loved one. "Knives are a guy thing, no doubt about it," said Gordon. "But we see more and more women building up large collections of knives. It’s not uncommon to see many customers coming back and purchasing multiple sets of knives because of the unique characteristics each knife brings.” Knives are works of art and can be enjoyed for a lifetime and be handed down to younger generations. So don’t stress any further for the perfect gift, DKC knives is your answer. DKC Knives is based in Castro Valley California. The company website is http://www.dkcknives.com. DKC Knives can be follow on Facebook as well as Instagram. Interested parties can sign up for the company newsletter at http://www.dkcknives.com and get updates on new knife releases.